Joe Manning and Julia Mashburn are not done with football just yet. The two Coahoma High School seniors were selected to participate in the Big Country FCA (Fellowship of Christian Athletes) All Star Football game. 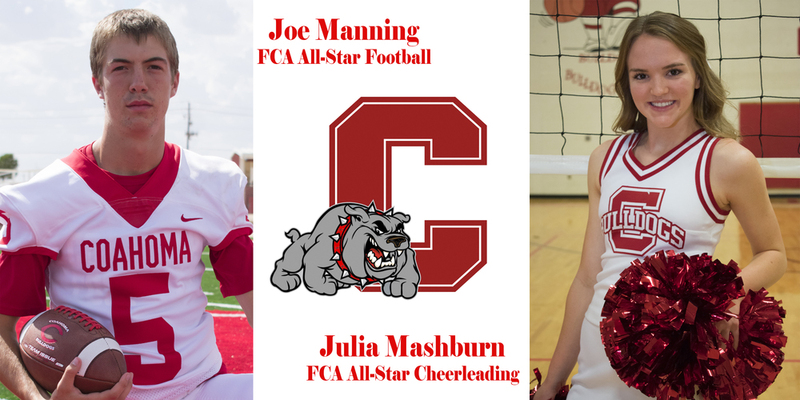 Manning, a 2018 Bulldog varsity wide receiver and defensive back, will play on the Red team and Mashburn will be cheering as a member of the All-Star Cheerleading squad. Manning is an all-around athlete who also participates in varsity basketball and track & field. Besides athletics, Manning is a stand-out academic and student leader. He is a member of the National Honor Society and serves as president of his class and the student council. He was named to the honorable mention list as defensive back for the 2018 2-3A, Division I All-District Football Team. Mashburn is on the varsity cheerleading squad at Coahoma. She is an All-American Cheerleader and standout volleyball player. She is also on the track team. Mashburn made the 5-3A All-District Volleyball honorable mention list for 2018. She is an A and A&B honor roll student and is active in her church group at College Baptist. The Big Country FCA All-Star Football game is set for June 8, 2019 in Shotwell Stadium in Abilene. FCA is the largest Christian sports ministry in the world and ministers to professional, college, high school, junior high and youth level athletes.